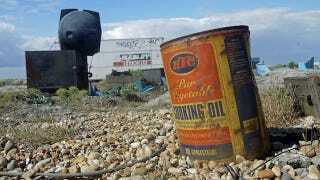 Used Cooking Oil Is a Hot Property on the Black Market. Seriously. People resort to the black market for all sorts of stolen goods: cellphones, watches, cars, babies. But used cooking oil? According to the Washington Post, that's a thing too. Thieves are now moving into the green market by stealing used cooking oil from the back of restaurants. They sell the sludge to recyclers, who then process it into biodiesel. The oil can go for as much as $4 per gallon on the down low.